This post sponsored by Sleep Innovations. Stay tuned to the end for a great giveaway! Also be sure to follow @sleepinnov and @orgjunkie on Twitter today for more #refreshyoursleep tips! Oh precious sleep, how I love thee. I never used to make sleep a priority, I would go to bed at 12 and be up again at 6 to start my day. I’d walk through each day exhausted and grumpy but there was always so much to do and never enough time to get it done it seemed. And then last year I purchased a Fitbit and started tracking my sleep and was shocked to learn that while I may have been getting six hours of sleep a night, those 6 hours were full of interruptions and restless periods resulting in much less sleep a night than I originally thought. It was really eye opening. Then this past fall I was diagnosed with the autoimmune disease, Rheumatoid Arthritis and I started researching everything I could about it. One of the main things I discovered was the importance of sleep and the direct relation it has with our health. Dr. Sarah Ballantyne, author of the Paleo Approach, tells us that adequate sleep is essential for regulating the immune system and hormones, for resolving and preventing inflammation and to support healing. Healthy individuals require seven to ten hours of sleep every night; those with autoimmune disease may require more. Yikes! Since then I’ve rearranged my life so I could be more mindful about how much sleep I get each night. Now I treasure sleep and the impact it makes on my health. I made it a priority to go to bed earlier and implemented a few more strategies in my bedroom to help me have a good night’s sleep. 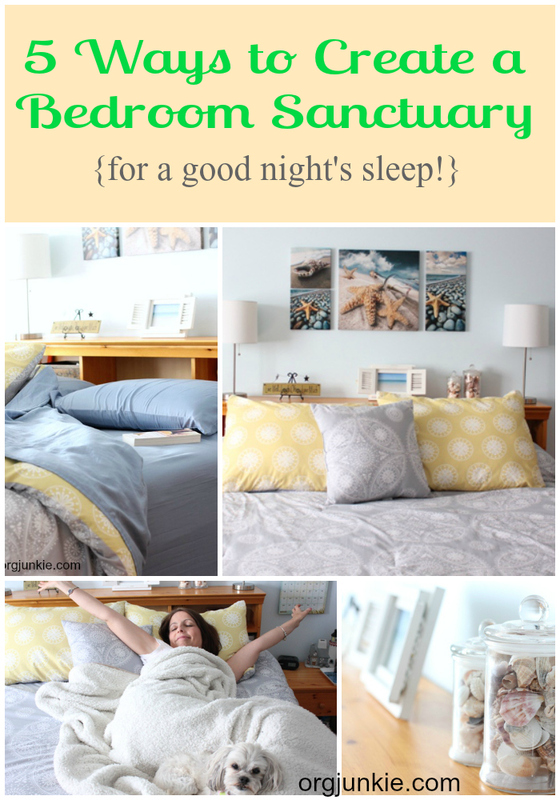 So if, like me, you want to up your sleep game, check out my 5 tips below for creating a bedroom sanctuary to ensure you get the healthy sleep you need. 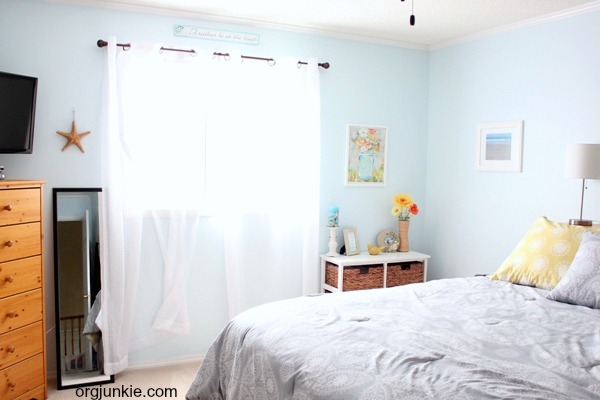 We spend so much time in our bedrooms but often they are the most neglected rooms in the house. They can quickly become a dumping ground with surfaces becoming piled high with clutter and clothes. Our bedrooms should be a place we come to unwind and relax and eventually sleep after a long day. It is next to impossible to relax when you are distracted in a cluttered, disorganized space. It’s a constant reminder of something that still needs to be done and it’s not so easy to turn that off when it’s all around you. You deserve better than that. I know everyone reacts differently but visual clutter could be one of the reasons you are having trouble falling asleep at night. 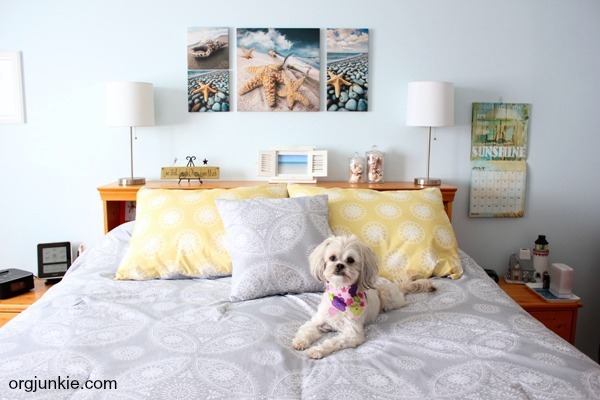 This post titled, 5 Things to Declutter Today to Make Your Bedroom a Haven will provide you with the help you need to clear the clutter out once and for all! Also if clothes are the clutter culprit in your bedroom, then you might need a little tough love from me with this post titled Org Junkie’s Tips for Parting with Your Clothes. One of the places I am most relaxed and at peace is on the beach. 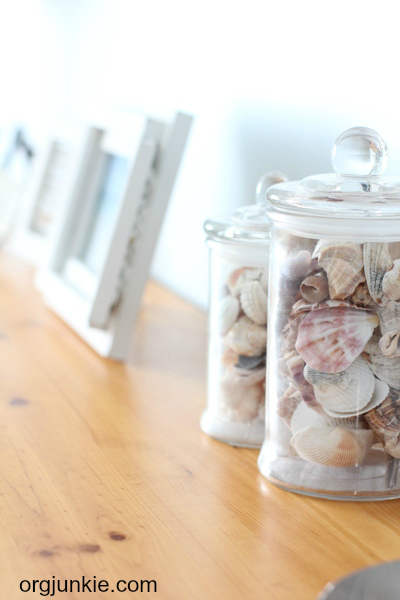 And while I don’t live anywhere near an ocean I decided to bring the beach to my bedroom. 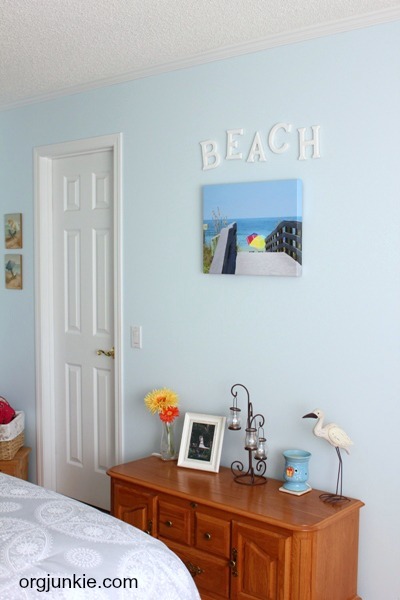 I painted my walls a soft sky blue color and added other beautiful decor that reminds me of where I am most happiest. When I walk into my room, I can immediately feel the tension leaving my body. 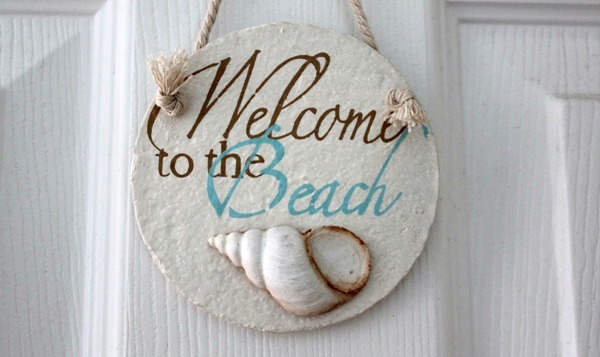 I have surrounded myself with things that represent a beach retreat for me. 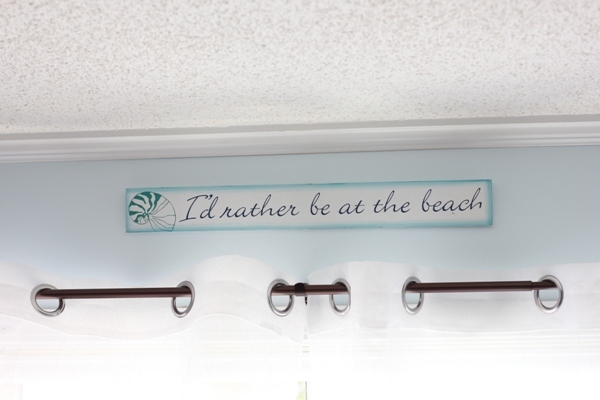 I found this “I’d rather be at the beach” sign from the thrift store. 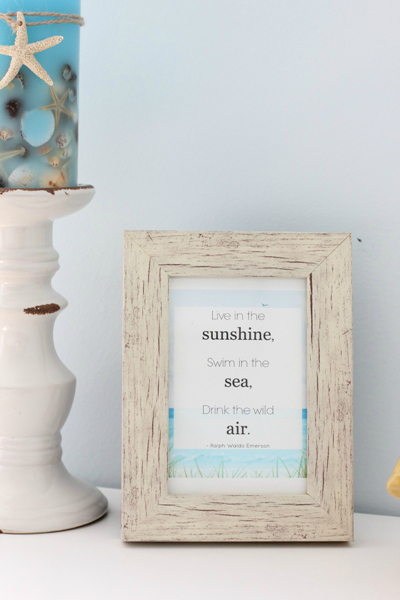 I took this picture on my wall below the last time we were in Florida and every time I look at it I get the same calm relaxed feeling I get when I walk over that bridge and catch a glimpse of the ocean. I absolutely love being in my bedroom and it is by far my most favorite room in the house. Surround yourself with things that bring you joy. 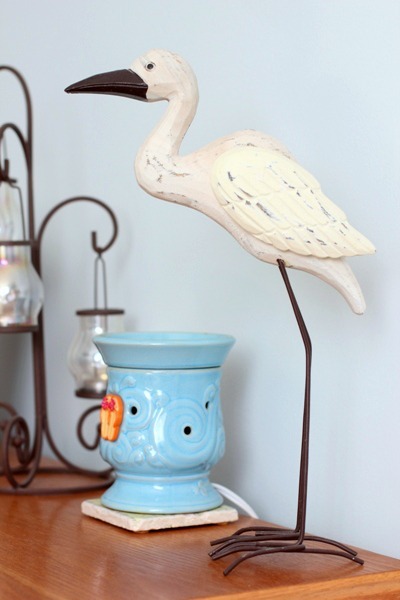 Things that bring you stress should not be in your bedroom. Okay this one is huge. Having a comfortable mattress and pillow is an integral part to getting a good night’s sleep. Our current mattress isn’t the most comfortable bed in the world and I’d toss and turn trying to find a position that didn’t leave me feeling achy and sore. It’s not that old though and buying a new one wasn’t in the budget. I was recently given the opportunity to try out the Sleep Innovations Instant Pillow Top — Memory Foam and Fiber Hybrid Mattress Topper which hadn’t even occurred to me to try as an option. What an excellent and less expensive option to buying a whole new mattress! The Sleep Innovations topper comes vacuum packed in a box and ships right to your door which is nice and convenient. 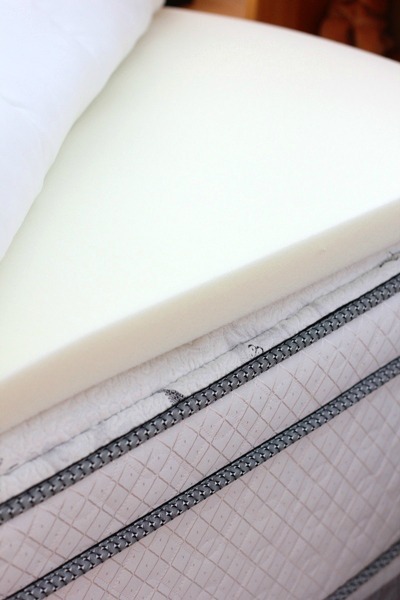 The topper comes with a comfy cover that not only fits over the memory foam base but over your entire mattress as well — instantly converting your innerspring mattress into a plush and luxurious pillow top mattress. The SureTemp memory foam is comfortable and doesn’t sleep too hot. It forms to body curves and has therapeutic support. Plus the cover makes it look like I have a brand new mattress! 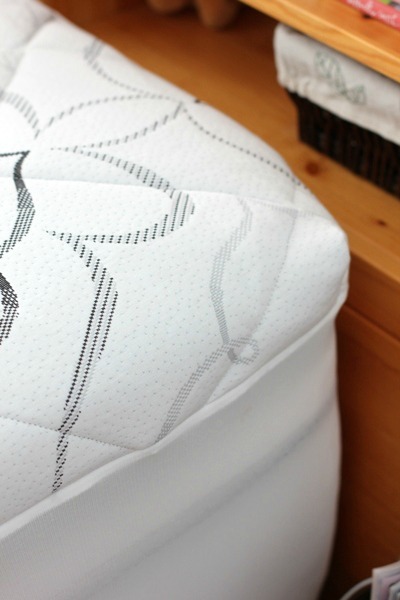 What a difference sleeping on this memory foam topper has made to my nightly sleep (keep reading to find out how you can win one for yourself!). So we talked about keeping the clutter out but what do we do with the stuff that is left and that we need to keep in our rooms? We organize it of course! 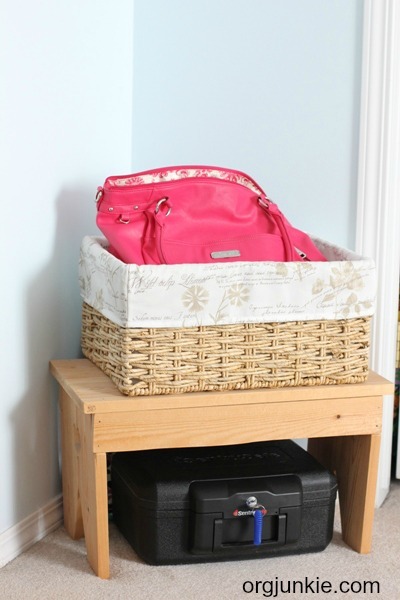 Look for organized solutions that will keep your stuff tucked out of the way and tidy. For instance, I use various night creams at bedtime (I’m over 40 what can I say!) and like to have them near me to put on when I climb into bed. We have this excellent headboard with various shelves and I added a basket for my creams that keeps them out of sight but still within reach. If I had them all out on top of the headboard it would look messy and be an interruption to my relaxation zone. 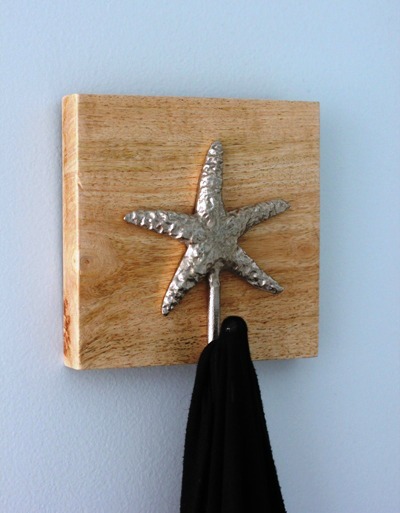 Baskets, bins and hooks are a great alternative. This cute hook holds my bathrobe. This wicker basket holds whatever purse I’m currently using in a very convenient spot on the way out the door. The lock box is where my kiddos store their electronics when not in use. My daughter made the bench for me in school. 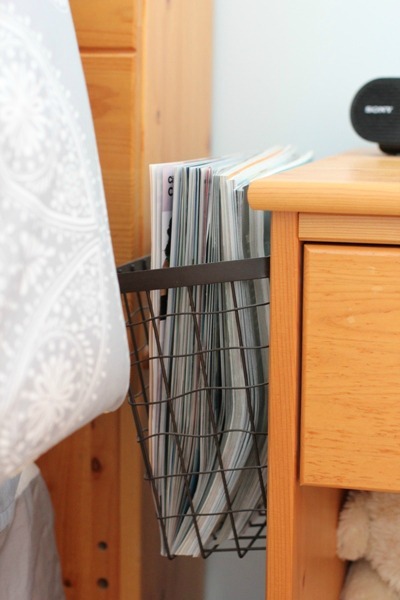 I added a wire basket to the side of my nightstand with Command Hooks for my magazines to keep my nightstand top as clutter free as possible. Also keep an organized nightstand drawer with all your essentials. 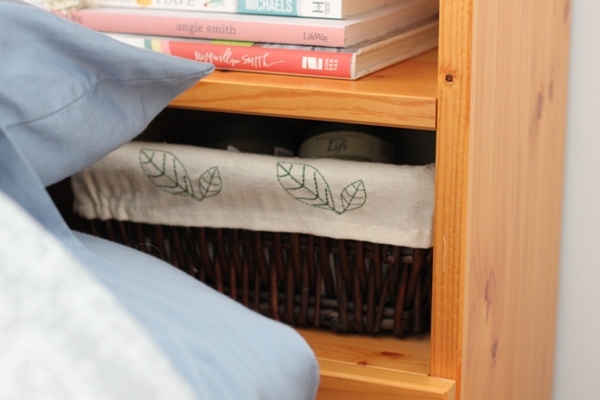 I wrote a post not that long ago on how to organize your nightstand drawer that you can check out. Kids and adults alike do so much better having routines in place. For myself, a nightly bedtime routine signals to my mind that it’s time to slow down and get ready for sleep mode. Being a creature of habit I do most of my evening tasks without even thinking about them now. I brush my teeth, take off my makeup, fill and turn on my oil diffuser, put on my night cream, read some, put in my earplugs and fall quietly off into dreamland. I even sometimes fall asleep listening to the sounds of ocean waves using the Sleepmaker Waves App (it’s free!). Heavenly!! Many people find it difficult to turn their brains off at night with so many things swirling around in their heads. In this case, it may be helpful to add a notebook and pen to your bedside table. Letting go of mind clutter is also a major factor in getting a good night’s sleep. Quick tip: to help you get into the habit of starting your bedtime routine each evening, set an alarm for an hour before bed as a reminder to disconnect from chores and other stimulating activities and start winding down for the night. 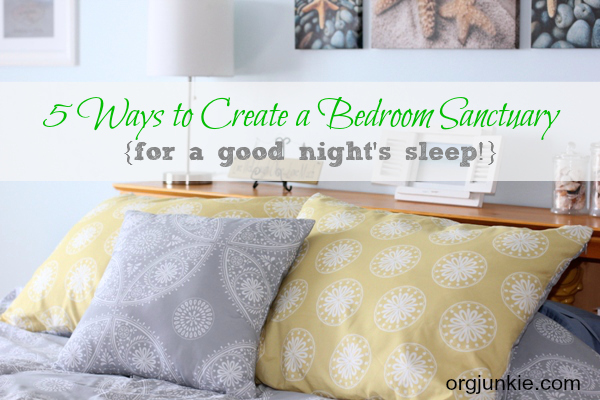 Make your bedtime routine simple, consistent and relaxing to help you have a refreshing night’s sleep. Our bedrooms should be a sanctuary for our souls, a place of comfort and peace that is a beautiful retreat from the chaos of our days. I hope putting these five tips into place will help you achieve that goal. For more information about Sleep Innovations and their products please visit them on the following channels: Facebook, Twitter and Pinterest. 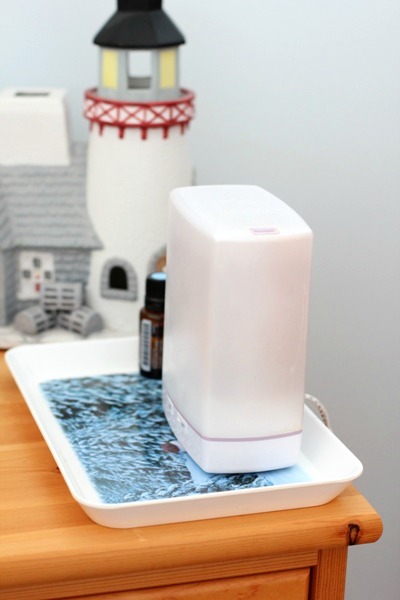 How would you like to win a Sleep Innovations Instant Pillow Top of your own? To enter just use the Rafflecopter form below, if you don’t see it right away give it a minute as it sometimes takes a bit to load up. The first option is mandatory and then I have added extra options for bonus entries if you want. Giveaway open to both US and Canadian and will end on July 30/15 at 4:00 pm MT. Good luck! Please note that this post may contain affiliate links (however, as always, any and all opinions are genuinely my own – or the author, in the case of posts by guest contributors). Affiliate links help to support my family and the work I do here on the blog. Thanks! Having lived in shared homes and single bedroom apartments I can say that all the above makes sense but my #1 savior was to have furniture I can close or a deposit room. We can talk about minimalism, organization etc all day but I still found the most practical with lots of mental releave benefits was to have a place were I can leave stuff organized and have a look into it all couple of weeks. Would love to win this mattress topper, it would give me the motivation that I need to get my bedroom in order to have a good nights sleep. I love and agree with all your great ideas.My bedroom is my sanctuary but I need to start getting more sleep. That’s something I have always struggled with. 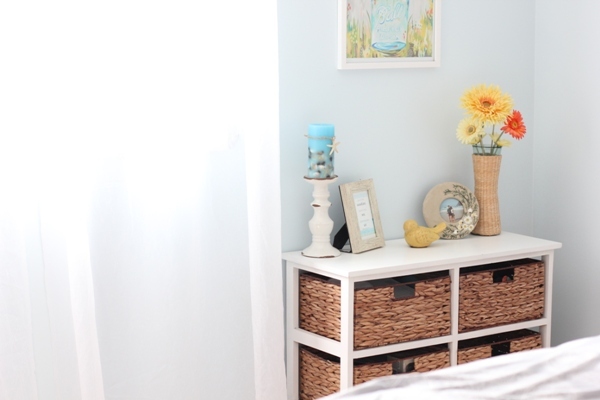 Oh… my bedroom is such a hard place to redesign. Every time I think I’m going to start, another part of life or the home jumps up to slap me in the face! I love this post and am saving it to read again to gain some INSPIRATION!! Thanks, Laura! Very pretty bedroom. 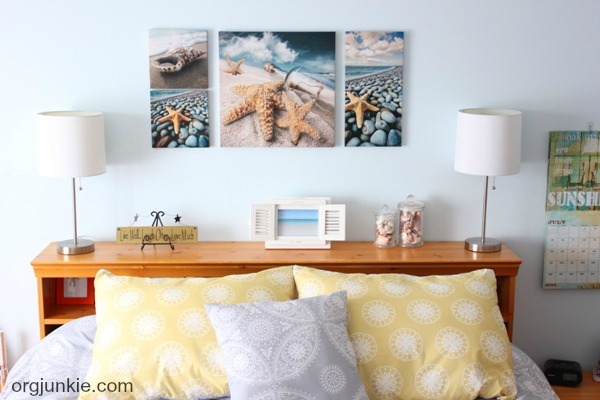 Where did you get the pictures above your bed? They are beautiful and I’ve been looking for something to go over my bed. Thanks. 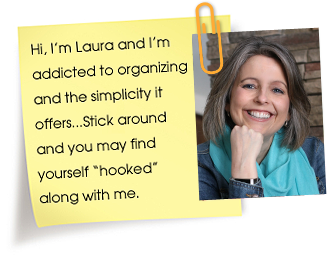 These are great tips Laura, thank you!